I teach Earth Science in an independent school. When I was hired for this position three years ago, all of my experience had been in the public school. Public schools in my state teach "integrated science." It had been years since I had taught a class that covered only the earth sciences. I knew I wanted to take a non-traditional approach; I knew I wanted to teach Earth Systems Science and not the usual earth-layers-plate tectonics-rocks & minerals-weather-water-space march through the textbook that had been my previous experience with the subject. I am a big fan of Michael Wysession and The Principles of Earth Science Literacy. That philosophy informs everything I do in my class. 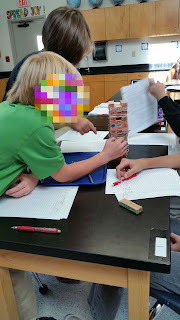 After I introduce my students to the idea of Earth Systems, I like to have them play Earth System Jenga as a culminating activity. It is so much fun! It gets a little (maybe a lot) loud, but the kids enjoy it, and they are able to describe impacts and interactions in earth systems. The lesson is an adaptation of one I found on the Internet, and tweaked to suit my classroom. I found several sets of the natural colored wooden Jenga blocks - you could use the colored ones as well. I used a marker to color the sides of the blocks the colors I wanted. This was a pain in the neck. I am going to spray paint them before next year for a nicer look. I found that my 6th graders had a hard time getting the blocks back in the box at the end of the period, so I am storing each set in a large resealable plastic bag.